I have turned into a huge fan of all things Heather. No, not 'Heathers'...lol. 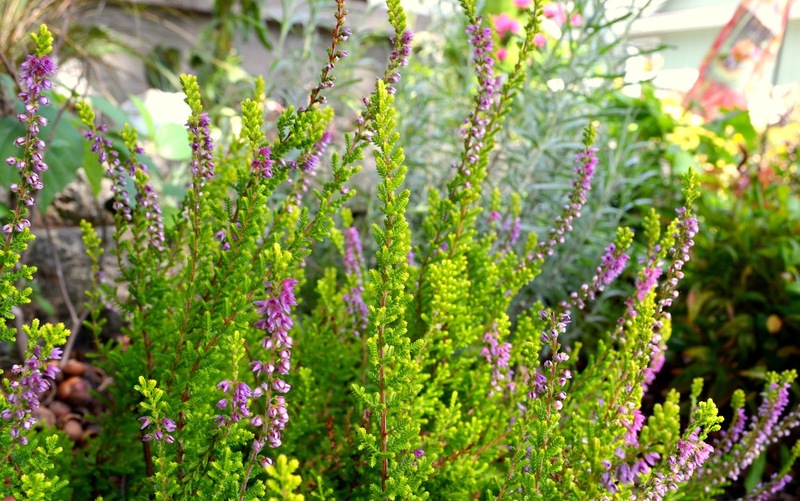 This summer blooming heather is currently showcasing her color. Bright, chartreuse green, new growth, on soft, short limbs combined with mauve - lavender colored blooms. Soon, the foliage will turn a coppery hue, changing to brick red in winter. It's really a striking multi-season plant. This heather is not an aggressive spreader and it has low water requirements. I really enjoy the changing foliage colors throughout the seasons. I think it also has a nice, informal but sturdy and compact shape. I found this heather at one of my old, favorite nursery stomping grounds, Tsugawa Nursery in Woodland, Washington, last year. I saw the coppery, summer foliage and was hooked. And...could it be that I stumbled onto a local nursery that specializes in heath & heathers this weekend? Why yes, I did. I ventured to Sebright Nursery this weekend to visit a gathering of the Cascade Nursery Trail vendors and found Highland Heather. Not only does she have the grass I'm looking for in stock, she also has HEATHERS! I'm quite excited. I took home a new little number at the sale this weekend and I'm looking forward to booking a visit to the nursery. 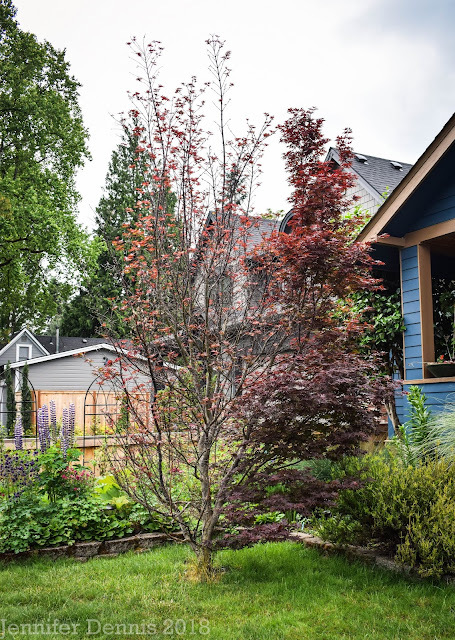 Visit Loree, over at Danger Garden to see more favorite plant of the week posts! I can't seem to get heather to survive in my garden. I love it, though. Truth be told I'm a little intimidated by heather, I would really like to include a couple in my garden but I'm afraid I'll make the wrong choice and regret it. 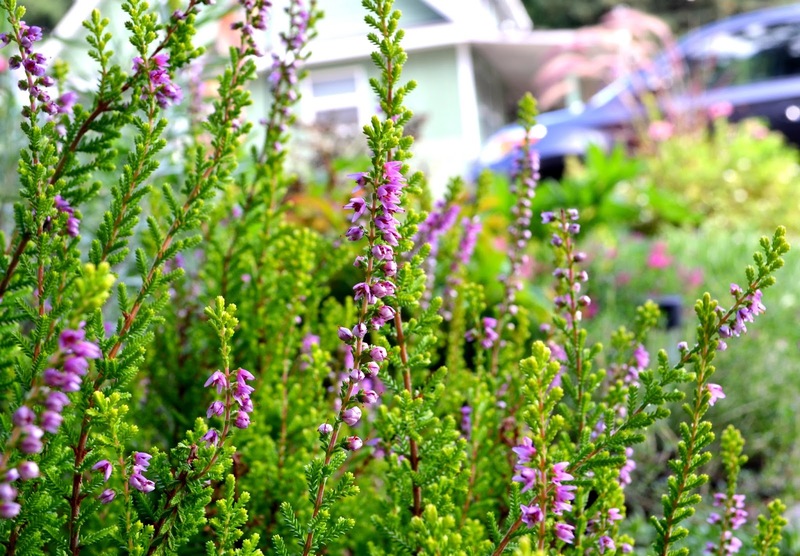 Thanks for the info on this one and the link to Highland Heather...I'm going to check them out (and maybe talk them into joining plant lust). I hope you get her hooked into Plantlust! They seem to have a wide variety :) I think you should take the plunge with a summer blooming heather. Love the heaths and heather and almost always come home with a new one from that very grower at HPSO sales. My current favorite is 'Red Fred'. :( That is a bummer. Nice one. I love your photos. I need to think about adding more Heather as well. I love your new blog look, Jennifer. Oh, it is a nice plant when flowering. I have couple of varieties near my pond, but the most amazing display of heather I saw last weekend when walking on Pembrokeshire coast. So amazing!! !